Spirit surveys its own predicament. The bright soil pictured left is loose, fluffy material churned by the rover's left-front wheel as Spirit, driving backwards, broke through a darker, crusty surface. At right is the least-embedded of the rover's six wheels. Homer's Iliad tells the story of Troy, a city besieged by the Greeks in the Trojan War. Today, a lone robot sits besieged in the sands of Troy while engineers and scientists plot its escape. Welcome to "Troy" - Mars style. NASA's robotic rover Spirit is bogged down on the Red Planet in a place the rover team named after the ancient city. So why aren't scientists lamenting? "The rover's spinning wheels have broken through a crust, and we've found something supremely interesting in the disturbed soil," says Ray Arvidson of the Washington University in St. Louis. Spirit, like its twin rover Opportunity, has roamed the Red Planet for nearly 6 years. During that time, the rover has had some close calls and come out fighting from each. In fact, it's been driving backwards since one of its wheels jammed in 2006. From the beginning, the rovers' motto has been "follow the water." Both rovers have been searching Mars for minerals formed in the presence of H2O. Mars appears dry today, but minerals can provide clues that water was once there. "It's been easy for Opportunity to find such minerals," explains Arvidson. "Opportunity landed in an ancient lake bed. Spirit has had to work much harder. Spirit landed in basaltic plains formed by lava flows chewed up by repeated meteoroid impacts. There's been little evidence of anything that was ever very wet." But when Spirit reached an area of Mars called the "Columbia Hills," the whole complexion of the mission changed. "Spirit came across iron hydroxide, a mineral that forms in the presence of water. That alerted us to the change. We started coming across more and more rocks formed in the presence of water." 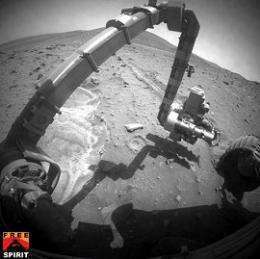 Then Spirit got stuck in a patch of loose soil on the edge of a small crater. Heavy sigh. Stuck again. A topographic map of Spirit's surroundings at Troy. Spirit is straddling the edge of a small crater. Sulfate materials are located in the crater (from the middle of the rover and extending to the left). The topo map was generated from stereo images taken by Spirit's navigation camera when it was approaching the area in April 7, 2009. "Spirit had to get stuck to make its next discovery," says Arvidson. As the rover tried to break free, its wheels began to churn up the soil, uncovering sulfates underneath. "Sulfates are minerals just beneath the surface that shout to us that they were formed in steam vents, since steam has sulfur in it. Steam is associated with hydrothermal activity - evidence of water-charged explosive volcanism. Such areas could have once supported life." "And most amazingly, the boundary between the sulfate-rich soil and the soil with just the generic concentration of sulfates runs right down the middle of the stranded rover. Spirit is lodged on the edge of a crater -- sitting astride the boundary!" "Also, the robot found that the top of the sulfate material is crusty. Ancient sulfates probably formed this crust as they were processed by variations in climate associated with changes in Mars' orbit over millions of years." Here's what the scientists think: When a Martian pole faces the sun in Martian summer, it gets warmer at that pole and the water ice shifts to the equator. It even snows there! Warm dark soil under the snow causes the bottom layer of snow to melt. The water trickles into the sulfates, dissolving the water-soluble iron sulfates and forming a crust with the calcium sulfates remaining. "By being stuck at Troy, Spirit has been able to teach us about the modern water cycle on Mars." Indeed, Spirit's saga at Troy has given scientists material evidence of past water on Mars on two time scales: ancient volcanic times, and cycles ongoing to the present day. "We've sat here for more than 6 months. That's a long time to take measurements. We've learned a lot. Troy is a good place to be under siege, but we’re ready to leave." Will Spirit break free to continue its incredible journey? Tune in to Science@NASA to find out if the escape plan works. It is incredible that after six years the rovers are still surprising us, stuck or not. What a success they have been. "Sulfates are minerals just beneath the surface that shout to us that they were formed in steam vents, since steam has sulfur in it. Steam has sulfur in it???? @tpb: The next sentence explains that it is volcanic steam - which contains sulfur. "Steam is associated with hydrothermal activity - evidence of water-charged explosive volcanism." The writer could have clarified it better. Google or Bing it for more details. if the martian soil deals you fluffy lemons, I guess you might as well make some sulfate lemonaid! Just because some steam vents on earth have sulfur doesn't mean they did on Mars. The point is that the sulfates found on mars may have nothing to do with steam vents. Probably a stupid question but, is the arm strong enough to lift and rotate the rover until it is off the rock that it is supposedly hung up on or until it is at least pointed backwards downhill? Also, since all of the minerals found so far on Mars are in an oxidized form (where did the oxygen come from?) it is likely that the "sulfur" in the volcanic "steam" vents was also oxidized and in the form of sulfur dioxide. Further oxidation of the SO2 to sulfur trioxide by reaction with oxygen in the atmosphere then neutralization by the iron hydroxide generated the sulfate ion. "From the beginning, the rovers' motto has been "follow the water."" HMMMM, then why is there no direct water measurement device like a conductivity probe or IR spectrometer? Many of the photos show one or the other rover's tracks passing from dry sandy soil into a lower area of wet cohesive sand and then out again. Is it water or some unknown process making the sand sticky? Must be the latter. Can't he claw his way out by using its arm like an ice axe in the sand. Probably hard to get a purchase on the sand. But worth a try. They could test it on earth using a copy of the rover...I assume that they have one. I don't know the specs but I suspect the motors in the arm were only designed to move the arm itself and not for doing push-ups, crater-climbing or pole-vaulting. @deatopmg: The robotic arm (technical name is "Instrument Deployment Device" = IDD) is not strong enough to lift or to move the rover. The arm exerts only 14 lbs (6,35 kg) of force while the rover weighs 150 lbs (68 kg) on Mars. Also this action could damage the scientific instruments at the end of the IDD.